To be honest, I'd trade being right about watching the Bengals fall flat on their faces (literally) for those two wrong picks anyway. (Believe me, I can rationalize just about anything). If there was one thing I was absolutely sure of, it was that Andy Dalton would make just enough plays for the Bengals to lose because that's his move. And the best part for the rest of the AFC is that the Bengals' move will be to make no move at head coach or quarterback despite the fact that they might be wasting one of the most talented rosters in the league. (On a semi-related note, it pleases me that the Redskins just said, "hey, give us some of that good Bengal karma" and hired Jay Gruden. Welcome to NFL hell Jay). It's my birthday so today is all about Irish Car Bombs (the drink not the act of terrorism) and winning picks. Let's do this. 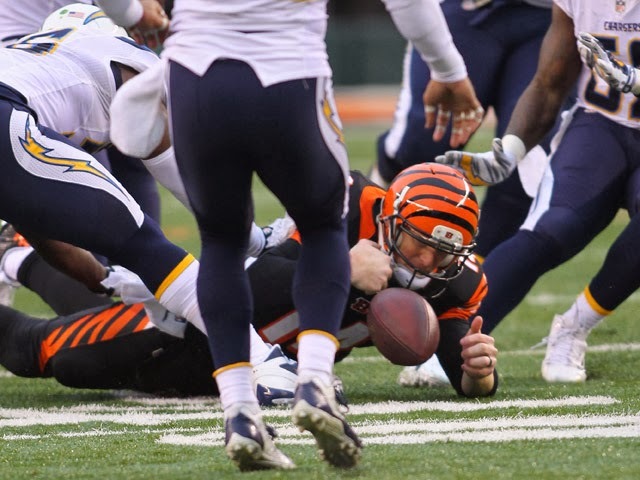 This pick is only slightly related to the 34-7 beatdown the Seahawks put on the Saints back in early December because, as we learned from the Chargers-Bengals rematch, you can't give much credence to even recent NFL history. This game is all about the following two numbers: 29.1 and 18.7. The first number is the average points scored by the Seahawks at home this season and the second number is the average points scored by the Saints on the road (including last week's Eagles' game). That may be oversimplifying things a bit but overly simplified is how I like my world and, when you consider that the Seahawks have one of the best defenses the Saints will have played on the road and the Saints have one of the most mediocre defenses the Seahawks will have played at home, that 10+ point gap could easily widen. I'm seeing 31-17 with an APB on a missing Jimmy Graham in the second half. unless Ray Lewis is involved. Here is one thing we absolutely know about this game - T.Y. Hilton's stat line is going to look something like 2 catches for 19 yards with no touchdowns and at least a couple kidney punches. And when that happens the question becomes, if they take away T.Y., then where are the Colts going to get their offense? Donald Brown? Coby Fleener? Griff Whalen? ** I just don't see them putting-up more than 17 points against Darth Belichik when he's had two weeks to prepare. On the other side, we've got Tom Brady who is the exceedingly wealthy man's Alex Smith against the defense that just let Alex Smith shred it for 378 yards and 4 touchdowns. I'm feeling 27-16 and good riddance to that ferret living on Andrew Luck's chin. I have the utmost faith in the Carolina defense but the utleast*** faith in Cam Newton/Ron Rivera v. Colin Kaepernick/Jim Harbaugh. Cam Newton is so freakishly talented that his day may come but it's going to take a little more time and at least a B+ receiving threat before he gets there. Also, a road team has to win this weekend and the 49ers are one of the best left in the tournament. And furthermore, hasn't this whole season been trending toward conference championship games of 49ers at Seahawks and Patriots at Broncos? And if I might add . . . enough already? (Good, because I didn't really have anything else to say). Touchdowns will be at a premium in this one but annoying shots of Jim Harbaugh on the sideline that make you want to throw things at the television will not . . . 20-13.
that's really all that matters right?" The Chargers have won five games in a row and the teams they've beaten this season include the Colts, Bengals, Eagles, Chiefs (twice) and Broncos. That makes six wins over playoff teams. On the other hand, they lost to the Texans, Raiders and Redskins when they couldn't score from first and goal at the one yard line for the win. It's that Redskin loss that I just can't get past. I don't care that the Chargers would have covered 9.5 points 16 out of 17 times this season. 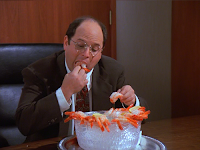 That Redskin loss makes me feel like Jerry when he found out his girlfriend was previously dumped by Newman. On the other side you have Peyton Manning who has spent the entire season hearing about what a bad playoff quarterback he is and how he can't play in cold weather and how his little brother has more Super Bowl rings than he does and how he is really the abandoned love-child of Tom Seaver and Meryl Streep (ok, maybe that's the first he's heard of that). Anyway, remember what he did to start the season when he was still pissed at the Ravens for stealing his Super Bowl chance last year? (He threw as many touchdown passes as Joe Flacco threw in the last seven games of the season . . . true story). Well I see him throwing a similar blanket party for the Chargers before Brady and Belichik come west to eat an entire wheel of his cheese and poop in his fridge. Something along the lines of 38-20. * For reasons too annoying to explain, my 12 year old son is a die-hard Colts fan. I normally just try to ignore it the same way I would if he walked around all day quoting Tyler Perry movies (which he fortunately does not), however, seeing as I have no dog in the NFL playoff race for the first time since 2007, I decided that this year I would be supportive (but only to a point because there is the whole Jim Irsay douche factor to keep in mind). Anyway, at about the time when it was 31-10 Chiefs in the 2nd quarter, I walked-in and he was watching soccer on the Spanish channel . . . and he doesn't speak Spanish. When I asked him what he was doing, he responded, "it's over." Then I convinced him to watch the start of the second half when Luck promptly threw a pick leading to 38-10. At that point I agreed that it was over but fortunately kept tabs on the game so we put it back on in the 4th quarter and we all watched it but he refused to come back in the room because, "it's just like that Bud Light commercial where the guy has to stay in the basement for his team to win." So congratulations Bud Light. Your NFL saturation campaign has reached the 12 year old demographic. It's really got me looking forward to Cialis ads featuring Demi Lovato and Taylor Lautner. "BL" stands for "Bros Lacrosse." ** There may be no greater indicator of how soft football has become than the fact that a 5-11, 197 pound receiver named Griff Whalen is catching passes for a playoff team. Jack Lambert would have hit Griff Whalen so hard just for being named Griff Whalen that he would have killed the whole Whalen family including Biff Whalen, Wellington Whalen and his parents, Halston Whalen and Wheatley Whalen. (The sad part is that I borrowed those names from Deadspin's Lacrosse All Name Team and half the kids on that team come from where I live. So much for my kids not growing-up to be 80's James Spader characters). *** "Utleast" - for when "least" just doesn't adequately express how little faith you have in something. As in, "I have the utleast faith in Robert DeNiro's desire to salvage what's left of his legacy after seeing the trailers for Grudge Match." I'm honestly starting to wonder if Raging Bull, The Godfather: Part 2, Goodfellas and Midnight Run ever really happened.